Good morning dearies. Today I have a request post from a reader! 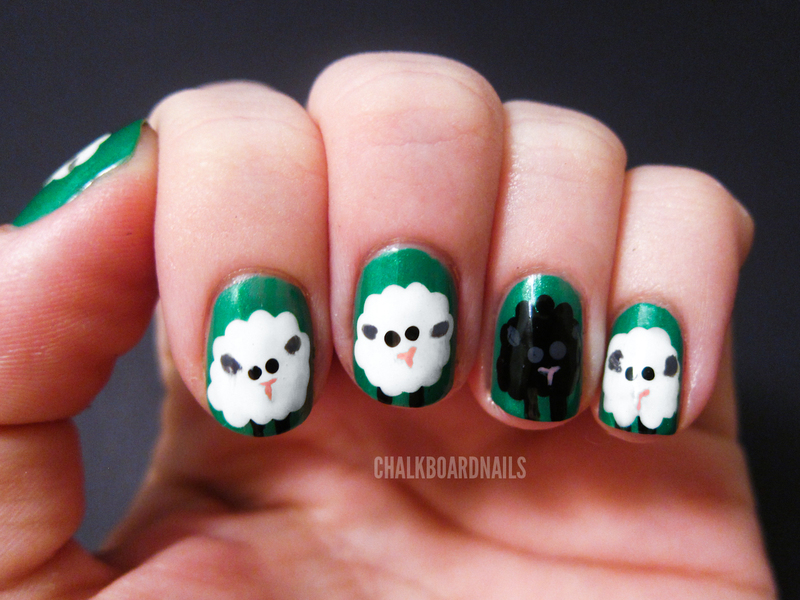 I was asked by Shannon G. on the Chalkboard Nails Facebook page if I could do a sheep design. I thought it was a really cute idea and so I told her I would do my best! I designed these to be uber cute. I think I succeeded! These nails remind me of the fat marshmallow ghosts. Perhaps they are cousins? And as an extra bonus, I made a tutorial for this manicure! Complete with my (now signature) homemade Photoshop graphics and all! I hope you like this, and, as always, if you follow this tutorial, make sure you come back and show me, or post it to the CN Facebook page! Paint your nails with your base coat of choice. Let dry, and add your "grass" color to your nails. Let dry. Dot a few drops of your black polish on to a piece of wax paper. Using your nail art brush, pick up some of the black and paint on your sheepie's legs. Place some white polish on a new section of your wax paper workspace. With the large end of your dotting tool, pick up some of the white polish and place large dots overlapping in a circular form. This will form the outside of your sheep, so you can make the "curls" tighter or looser as you see fit. Fill in the white circle with more white polish. I just used the same end of my dotting tool to do this. Using the small end of your dotting tool, add two small black eyes to the center of your white fluffy sheep body. You may have to add a few more drops of black to your wax paper workspace, as the black you used for the legs has probably dried by now. 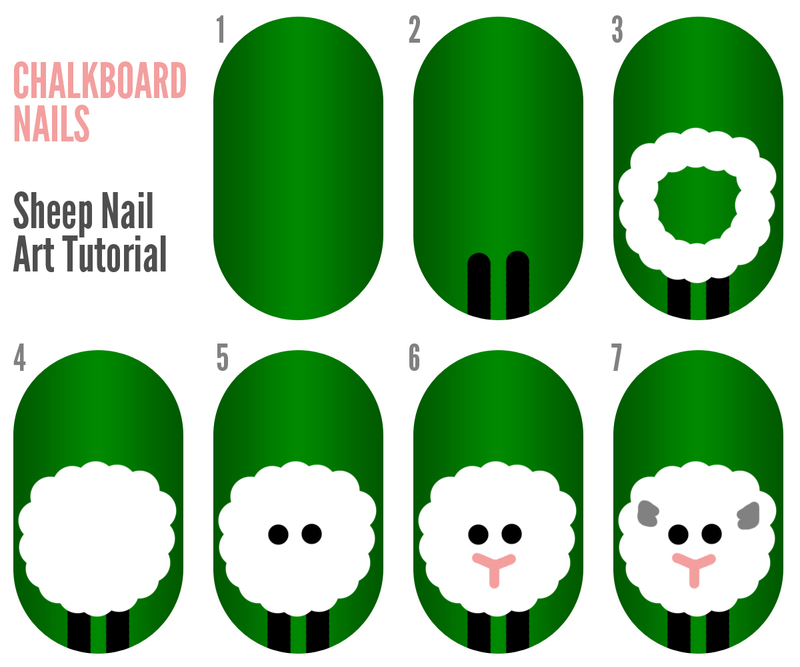 Place some of your pink polish on your wax paper, and using your small nail art brush, add the nose markings to your sheep. I made a very wide "V" shape first and then drew the line straight downward from the middle of the "V" second. When you are finished, clean off your nail art brush as we will be using it for the gray in the next step. Place some of your gray polish on your wax paper. Using your small nail art brush, paint on some gray ears next to (and just a touch above) the eye dots you made. Let your nails dry for a bit to prevent topcoat smearing. Clean up your cuticles at this time if necessary, then top with your favorite topcoat and you're done! your tutorial makes it seems really easy! I'm going to try it! thanks! This looks so cute and easy! i love it!! and love your tutorial! SO cute, I can barely stand it! Thanks for the graphical tutorial, I always love how much simpler that makes it! So cute! This seems so simple, maybe even I can do it!! as a knitter i love this even more than i normally would as just a nail polish junkie! this is so adorable! i might try it someday! ohh i love this. nice post! you're gonna get me off my lazy jass to do nail art one of these days. (not today). love ya! I love your photoshop tutorials! and your design is so cute! Adorable =]! I gotta try this =]! this is the cutest thing I've seen all day! Ahhh they are too adorable!! I love the one little black sheep too, awesome touch!! love it! so simple to create! tnx! I really love the way you show your steps. So unique and so easy to follow. Really great! Soooo freaking cute! Another thing on my list to try!! Adorable! This is made my day :) You rock like always! Such a fantastic tutorial and a super-cute design! I love the format of your tutorial. It's just perfect! Btw, what does a a dotting tool look like? Thank you all so so much! I am glad you are liking the tutorial graphics, it is a format I think I am going to stick with! The tutorial format was something I was considering cause I saw a hand-drawn one on someone's blog! Nevertheless, this is cute! How cute are they!? You did an awesome job! Haha! 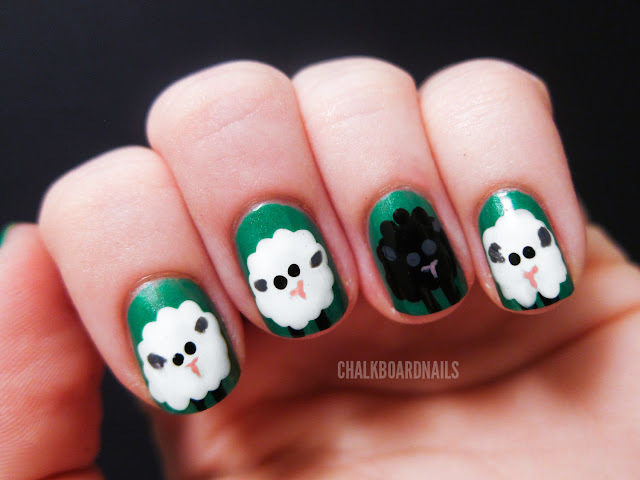 Sheeps are cute, love this design! I'm pretty sure I could pull off my left hand but the right would never look like something anyone could identify. This is just adorable! Not work appropriate perhaps, but I think for Easter it will be a must! This is soo cute, and yet so simple that anyone could do it! I love the set up of your tutorials too, They're so easy to follow! Thanks! I'll keep my eye open for one next time I'm at the beauty supply store. Thanks for posting the tutorial! So cute! i love the little lambs! Adorable! It would even cuter if the sheep had much larger eyes. I can’t wait to see what you make next! If you create any more looks like this that you think fall into the Spring and or Easter category, post links on my Facebook wall or comment on the post and I’ll add them and the links in the post! Keep up the great work! Very nice post! This blog is amazing, I am book marking it right now!